WASHINGTON -- The parent agency of the AmeriCorps program violated federal budget law in approving more volunteer positions than it had scholarship money to support, the agency's inspector general said in a report Monday. J. Russell George, inspector general for the Corporation for National and Community Service, blamed the violation on "inadequate oversight, flawed membership and financial reporting systems, job responsibilities for key personnel that were either not well-defined or adhered to" and ineffective communication among managers. The 17-page report named several current and former senior employees as responsible for violation of the Anti-deficiency Act. The violation, if proved intentional, can be punishable by removal from office, small fines or jail time. The report did not find any willful violations, although George said his office still was investigating. Chief Executive Officer Leslie Lenkowsky, who announced his resignation this month, disagreed with the findings, saying in a letter to George that the inspector general's office used outdated financial data. The corporation is completing its own analysis of what went wrong and whether the law was violated by approving 20,000 more volunteer slots than there was money for scholarships. The investigation grew out of a decision last November to halt AmeriCorps enrollment because of it lacked the money to pay the education grants that volunteers contractually earn after a year of service. Enrollments resumed in March. AmeriCorps officials put part of the blame for the shortfall on increased enrollment in the program following President Bush's post-Sept. 11 calls for Americans to volunteer. The inspector general report said the corporation's "management did not fully comprehend the ramifications of this increased enrollment" until late last year. It blamed several people who handled the trust, including Lenkowsky, a presidential appointee, and the chief operating officer at the time, Wendy Zenker, who was transferred in February to a less senior position. 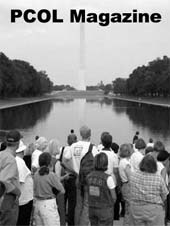 AmeriCorps began in 1993 as a domestic Peace Corps for mostly college-age volunteers who do community service such as mentoring children and cleaning the environment. They receive stipends during their service and money afterward for college or graduate school or to pay off student loans. The Office of Management and Budget estimated that the enrollment miscalculations resulted in a $64 million trust deficiency, which Congress covered in a bill last March that provided extra money for the war in Iraq. Congress also cut grants for 2003 and capped enrollment at 50,000 volunteers. Last Friday, the House rejected providing the program another $100 million this year that AmeriCorps supporters say would provide for 20,000 more volunteers. 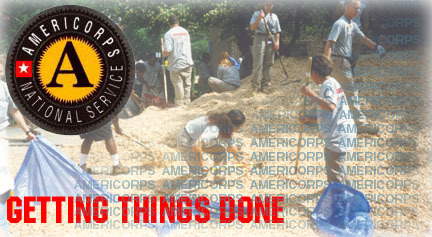 Bush has requested $554 million for AmeriCorps for 2004, enough to pay for 75,000 volunteers. The House, however, has approved enough money for 55,000. Read and comment on this story from Slate from June 23, 2003 on what's wrong with Americorps. AmeriCorps is in a fiscal crisis because they hired more volunteers than the program was able to pay. While President Bush boasted that AmeriCorps was "expanding mightily under Les's leadership," recruitment had to be suspended last year because of a shortfall in the trust that funded education grants for AmeriCorps members. There are two problems at Americorps. The first was that the agency lacked any reliable means to know precisely how many volunteers it had and had only a fuzzy idea about what financial liabilities it was taking on. The second problem was that nobody paid much attention to how much money was in the trust used to pay education grants. In previous years, the fund had always run a surplus. So confident was Americorps of the fund's invincible solvency that a year earlier they had asked Congress for no new funds for the trust�even as AmeriCorps, we now know, was exceeding its targeted enrollment by tens of thousands of new members. The lack of basic information about how many members AmeriCorps had can be blamed on the agency's decentralized management system and grant-giving authority. This was by design. Clinton had devolved control to state commissions, whose directors are appointed by governors, in order to win the program support from the governors. With cash rolling out to the states in massive annual increases, what was not to like? If AmeriCorps can't make itself accountable to Congress, national service may go the way of Lyndon Johnson's "community-action"-minded War on Poverty and Richard Nixon's Comprehensive Employment and Training Act, a jobs program abused by the states and killed off by Ronald Reagan. The graveyard of American social policy is abundant with similar decentralized programs that were killed off by horror stories of incompetence and mismanagement. How Leslie Lenkowsky sank national service. Last week, AmeriCorps indicated it could only fund half the number of members it had bankrolled in recent years to build houses for the poor, teach reading in the inner city, and much else. The budget cuts were forced on AmeriCorps by a Republican-run Congress that had never been particularly fond of Bill Clinton's national service program. But the real blame for the demise of AmeriCorps�which President Bush had embraced and planned to expand�rests with the man Bush chose to oversee it. As the CEO of the Corporation for National and Community Service, Leslie Lenkowsky is the ultimate boss of AmeriCorps. He ran it into the ground. Lenkowsky's chief sin was to commit AmeriCorps to hiring more volunteers than the program was able to pay. While President Bush boasted that AmeriCorps was "expanding mightily under Les's leadership," recruitment had to be suspended last year because of a shortfall in the trust that funded education grants for AmeriCorps members. The accounting breakdown resulted in two outside reviews, by the Office of Management and Budget and the General Accounting Office, as well as an internal investigation by the corporation's inspector general. A few weeks ago, Lenkowsky announced he would be stepping down, claiming it had nothing to do with mismanagement controversies that have since led Sen. Barbara Mikulski, D-Md., to call for his immediate resignation. What happened at AmeriCorps? It boils down to two problems. The first was that the agency lacked any reliable means to know, at any given time, precisely how many volunteers it had. Consequently, it had only a fuzzy idea about what financial liabilities it was taking on, since each volunteer was promised, at the end of his tour, an education grant worth $4,725 per member. The second problem was that nobody paid much attention to how much money was in the trust used to pay those education grants. In previous years, the fund had always run a surplus, thanks to years of Clintonian munificence. So confident were Lenkowsky and company of the fund's invincible solvency that a year earlier they had asked Congress for no new funds for the trust�even as AmeriCorps, we now know, was exceeding its targeted enrollment by tens of thousands of new members. The lack of basic information about how many members AmeriCorps had can be blamed on the agency's decentralized management system and grant-giving authority. This was by design. Clinton had devolved control to state commissions, whose directors are appointed by governors, in order to win the program support from the governors. With cash rolling out to the states in massive annual increases, what was not to like? Lenkowsky favored such decentralization and wanted to devolve management still further. In a Weekly Standard article published a few months before he was named to run the corporation, Lenkowsky argued that AmeriCorps should be "voucherized," with payments going directly to grantees rather than to the organizations that doled out the grants. He noted that this scheme might "dismay the auditors" but shrugged that worry off. Once in office, Lenkowsky never implemented his voucher scheme but remained faithfully indifferent to accounting concerns. It's instructive to compare AmeriCorps' recruitment practices to that of VISTA, a small organization also under the umbrella of the Corporation for National and Community Service (and thus Lenkowsky's authority). In November 2001, VISTA capped its own recruitment because of the general upsurge in volunteers after Sept. 11. One reason VISTA was able to foresee that its enrollment threatened to exceed its budget, according to Matt Dunne, who was then its director, was that its members were all payrolled through Washington. Congress learned of the looming shortfall in November. The fallout was quick and severe. Milkuski called AmeriCorps the "Enron of nonprofits." Republican Sen. Kit Bond of Missouri briefly raised the prospect of criminal sanctions for the officers responsible (it's against the law for a federal agency to commit unappropriated federal moneys). Congress then decided to cap membership at a maximum of 50,000. But because of a ruling from the OMB, much of AmeriCorps' funding will be devoted to paying for financial obligations incurred earlier, placing the actual number somewhere around 35,000 (which includes 22,000 slots that were held up by the suspension). Support for AmeriCorps in the Senate has resulted in a request for a $200 million supplemental appropriation, which would bring the number back toward 50,000 but still well below recent levels of membership. AmeriCorps' decimation is, among other things, a blow to President Bush's goal of providing social services via faith-based agencies, many of whom already rely on AmeriCorps. Director Laura Chalker of the West Side Ecumenical Ministry in Cleveland says the number of members they have working with at-risk teens will be cut in half, as will the number of their after-school centers. The maiming of AmeriCorps infuriates its supporters. Sens. John McCain, R-Ariz., and Evan Bayh, D-Ind., (co-authors of another national service bill) have criticized the president for backing away from AmeriCorps when continued support became inconvenient. Democratic presidential candidate John Kerry recently trotted out his own plan for a massive increase in national service, suggesting AmeriCorps' promise and failings could become a campaign issue in 2004. But if AmeriCorps can't make itself accountable to Congress, national service may go the way of Lyndon Johnson's "community-action"-minded War on Poverty and Richard Nixon's Comprehensive Employment and Training Act, a jobs program abused by the states and killed off by Ronald Reagan. The graveyard of American social policy is abundant with similar decentralized programs that were killed off by horror stories of incompetence and mismanagement. The financially troubled AmeriCorps program has shown signs of righting itself, but even its biggest backers say that more changes are needed. More than 4,600 people have joined the national service program since March, after an infusion of $100 million from Congress allowed officials to lift a five-month freeze on new enrollments. Officials vowed not to repeat managerial lapses that led the agency to approve more positions last year than it could financially support. "Things got out of balance," said Leslie Lenkowsky, chief executive of the Corporation for National and Community Service, which oversees AmeriCorps and two other service programs. "We caught it in time. We've now put new procedures in place that we think will prevent that from recurring." Concerned about the agency's financial footing, Congress imposed an enrollment cap of 50,000 for fiscal 2003. The program had 47,901 members enrolled as of last week. President Bush has requested a $150 million budget increase for fiscal 2004, which he says would be enough to boost enrollment to 75,000. Bush has embraced the Clinton-era program, styled as a domestic Peace Corps, as a way to advance his "compassionate conservative" agenda. AmeriCorps volunteers serve 20 to 40 hours a week and provide such services as home-building, literacy coaching and cleaning parks and streams. The president also wants the agency to become more involved in domestic preparedness. Some volunteers get modest living stipends, but all participants are eligible for $4,725 grants to pay for college or graduate school, or to pay back student loans. Marc Racicot, the Republican National Committee chairman and a member of the corporation's board of directors, said officials are "aggressively" addressing shortcomings in the 10-year-old program. "I think we're moving very positively in the right direction," said Racicot, a former governor of Montana who was appointed to the board by President Bill Clinton. "This is a very new enterprise. There's no allegation here of any kind of misconduct. There's only concern about making certain that it is as efficient and effective as it can possibly be." Lenkowsky said the agency is implementing a financial accountability system so that key decision makers know their budgets. Officials also are trying to better measure AmeriCorps' accomplishments and are working with the Office of Personnel Management to improve management of the agency's workforce. "There's still a lot to do," he said. Asked about rumors circulating at the agency and on Capitol Hill that his job is on the line, Lenkowsky, who was appointed by President Bush, said: "I don't think it is. I've not heard anything from the White House to that effect. . . . Nobody goes to work in government forever, but I am at my job because I believe very strongly in the value of what we're doing here." Members of Congress say they are hopeful, but not yet convinced, that the agency has turned its fortunes around. Sen. Christopher S. Bond (R-Mo. ), chairman of the Senate appropriations subcommittee that oversees AmeriCorps, said: "We are cautiously optimistic that the corporation has finally gotten our message that these management problems are unacceptable and must be fully addressed in order to ensure that its programs are serving the interests of the communities, volunteers and the taxpayers." Sen. Barbara A. Mikulski (D-Md. ), a fan of AmeriCorps but not its management, said the corporation board "needs to get its house in order" and report on its reforms by the end of May. "At the grass-roots level I think national service is alive and well," she said, "but I am very deeply troubled about the management and financial situation at headquarters." Everyone agrees that the problems of the agency are complex. They turn, in part, on a dispute over when officials should consider money in a $100 million trust fund for volunteers' scholarships obligated to those who have signed up for the program. Officials have routinely figured that some who sign up won't complete their service or, even if they do, won't seek an education grant, which does not have to be claimed for seven years. The General Accounting Office, the investigative arm of Congress, found that AmeriCorps officials ran into financial trouble because they did not always factor in eligibility for the education awards. That led the agency to sign up more people than it had money to pay in the long run. GAO officials recommended that the agency come up with a better system of accounting for such obligations. J. Russell George, the inspector general for the corporation, last month told the Senate subcommittee that the agency lacked sufficient internal controls to assess the financial impact of enrollments. He is still investigating the agency's problems and plans to recommend an accounting standard. "Until that question is answered, this is a very muddy situation," George said. Read and comment on this story from Newsday on Americorps, one of the sister organizations to the Peace Corps under the USA Freedom Corps, and the problems that contributed to the enrollment freeze at the national service program last year. The Corporation for National and Community Service violated its own rules by approving more AmeriCorps volunteers than it could provide with education grants, said the agency's inspector general, J. Russell George. He complained that senior management had known about potential enrollment problems in July but did not inform the committee until four months later. "It's like Enron's gone nonprofit," said Sen. Barbara Mikulski, D-Md., threatening to disband the agency if its management does not improve soon. The agency's chief executive officer, Leslie Lenkowski, said management and budget improvements are under way, including a shuffling of senior positions but he added his team has "a lot more to do" and said the inspector general and GAO reports could produce more changes. WASHINGTON -- Poor management in the agency that oversees AmeriCorps contributed to the enrollment freeze at the national service program last year, investigators told a Senate subcommittee Thursday. The Corporation for National and Community Service violated its own rules by approving more AmeriCorps volunteers than it could provide with education grants, said the agency's inspector general, J. Russell George. 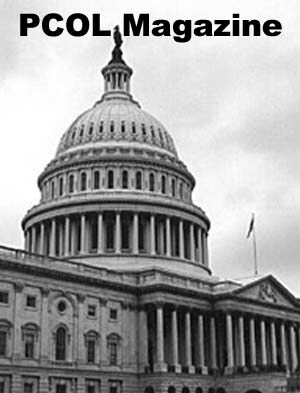 Congress this year voted to cap AmeriCorps enrollment at 50,000 in 2003. Bush has requested an increase of more than $150 million for the program next year, raising its budget to $554 million, enough to finance an enrollment of 75,000. The enrollment freeze from November to March put in limbo thousands of potential volunteers and hundreds of service projects across the country. Although there was enough money to pay current volunteers, the National Service Trust that hands out educational stipends after two years of AmeriCorps service was running dry. 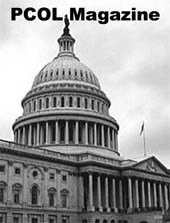 While praising the program itself, senators chastised corporation management. Sen. Kit Bond, R-Mo., chairman of the Senate Appropriations subcommittee that oversees AmeriCorps funding, compared its parent agency to a creaky house built on shaky ground: "Despite its occupants' efforts to correct the problems, the foundation continues to crack and sag." He complained that senior management had known about potential enrollment problems in July but did not inform the committee until four months later.for some four months. "It's like Enron's gone nonprofit," said Sen. Barbara Mikulski, D-Md., threatening to disband the agency if its management does not improve soon. The agency's chief executive officer, Leslie Lenkowski, said management and budget improvements are under way, including a shuffling of some senior positions. But he added his team has "a lot more to do" and said the inspector general and GAO reports could produce more changes. Lenkowski attributed problems in the educational trust partly to miscommunication at the top and failure to properly track enrollment in relation to available funds. "They've been living life on the edge," said Tom Armstrong, an assistant general counsel at the GAO. "They've been tracking based on projections instead of real amounts." The AmeriCorps program originated 1993 as a domestic Peace Corps for mostly college-age volunteers who work with nonprofits on projects like mentoring children and environmental cleanups. They receive stipends during their service and educational awards afterward. Welcome Dr. Lenkowsky and Russell George, who is testifying for the first time as the Corporation's Inspector General. As the Godmother of national service, I have fought to uphold the original principles that our national service programs were founded upon. These principles are: to provide qualitative and quantifiable service to communities while we create "habits of the heart", and reduce student loan debt. The idea behind National Service was to link our values to public policy. And to provide young Americans with an opportunity to serve their communities while helping to pay for college. I supported these principles even when they were not popular while being mindful of the need for responsible stewardship and of taxpayer dollars. I support the President's call to service. But I cannot support a bureaucracy that breaks the law, mismanages taxpayer dollars, and creates uncertainty for our communities and our volunteers. The Corporation for National Service needs to get its house in order, or it will be unable to take national service into the new century equipped to meet new challenges. I am pleased that the President embraced national service, and I want to work with him in a bipartisan way to take national service into the next century. But I am really concerned that management problems call into question the Corporation's ability to grow while standing sentry over taxpayer dollars. So my goals for this budget hearing are two-fold: First, I hope the Corporation can restore the confidence of our communities, non-profits, and graduates of national service programs. The VA-HUD Subcommittee is on their side; promises made must be promises kept, both to volunteers and to communities. Second, I hope the Corporation can begin to restore the Subcommittee's confidence that appropriate steps are being taken to prevent mismanagement and uncertainty. I was deeply troubled when the Corporation revealed that its standard operating procedure was to enroll more volunteers than the Corporation had funds to support. Last year, the Corporation budgeted for 50,000 volunteers, but it enrolled over 70,000. This created a critical shortfall in the National Service Trust which pays for volunteers' education awards. The Corporation broke the law. The law requires for every volunteer enrolled, there must be a deposit into the Trust to pay for that volunteer's education award. This concept is simple, straightforward, and is spelled out in the Corporation's statute. The Corporation's mismanagement of the AmeriCorps program has jeopardized the very principles upon which National Service was founded to provide young Americans with opportunities to serve their communities while helping to pay for college. The Corporation had to "freeze" volunteer enrollments. This created uncertainty for volunteers, who were waiting for assignments; for communities, who were ready to put the volunteers to work; and for graduates of the Corporation's programs, who were concerned about the status of their education awards. This happened at a time when the public's interest in volunteering is very high, and many organizations have experienced a large increase in applications. The consequences of the Corporation's mismanagement were grave. When the House and Senate met to conference for 2003, the House had $0 for National Service, and the White House did not weigh-in that National Service was a priority. We struggled to just level-fund National Service, but we had to increase the Trust to $100 million, to fix the Corporation's mistakes. This meant that there is about 30 percent less funding for programs in 2003. I was very disappointed that we could not support the President's call to service. I was especially puzzled when public statements by Corporations officials seemed to blame Congress for the "freeze" because the government was operating under a Continuing Resolution. For the record, I want to be perfectly clear: the VA-HUD Subcommittee has always provided all the resources that the Corporation has requested for education awards. I want to acknowledge Congress had rescinded funds from the Trust in the past. These rescissions were taken with the Corporation's advice and assurance that the Trust would be able to fulfill all education awards. So the Subcommittee has relied on the Corporation, the Board, the IG, and OMB to be the accountants for the Trust. Unfortunately, the accountants failed the Subcommittee, failed our communities, and failed our volunteers. To make matters more complicated, OMB recently decided to change the rules of the game for the Trust. The Corporation has always been able to count both appropriations and interest when calculating Trust funding. Now, OMB says that the Corporation can no longer count interest earnings in future budgeting for the Trust. So VA-HUD has included $64 million for the Trust in the Supplemental�this is the amount that the President requested. Moving forward, I want to know what steps the Corporation is taking to ensure that budgeting for AmeriCorps programs, and education awards is accurate. I also want to know what the Board and the IG will do to ensure proper oversight of the Corporation. The 2004 budget request is $598 million for all National Service programs under the VA-HUD Subcommittee's jurisdiction. This is $167 million above 2003 � a 40 percent increase. This is in addition to $365 million requested under the Labor-HHS Subcommittee. For a grand total request of almost $1 billion for National Service in 2004. The budget requests a $140 million increase for the AmeriCorps program to increase the number of volunteers from 50,000 to 75,000. Again, I want to support the President's call to service. But I really question whether the Corporation can grow until we are sure that its financial house is in order. Other areas of the budget are status quo. There is a small $2 million increase for the National Civilian Conservation Corps to open a new "satellite campus" this year, and the Learn and Serve program remains level-funded at $43 million. The budget request includes three earmarks. Two of the earmarks are authorized and were funded last year: $10 million for Points of Light, and $7.5 million for America's Promise. There is a new earmark in the budget: $3 million for Teach for America. These are good organizations that are worthy of our support. But I am disappointed that the budget does not fund Challenge Grants. Last year, Challenge Grants were our "policy solution" to earmarks. VA-HUD funded Challenge Grants for the first time. Grants will go to nationally recognized organizations that raise private funding. Grants require a 2 to 1 match. Last year, VA-HUD received almost $40 million in earmark requests from groups that deserve our support. But we couldn't fund them all, and we didn't want to pick winners and losers. I would like to know why the budget eliminates Challenge Grants. I would like to see Challenge Grants continued as a policy solution to earmarks. Volunteerism is our nation's trademark; it highlights what is best about America. Volunteer programs are the backbone of our communities. They help preserve the safety net for seniors, keep our communities clean, and get our kids ready to learn. This is an important time in the history of national service. National service is at a crossroads, and so is our nation. So I hope the VA-HUD Subcommittee can count on the Corporation to get its house in order so we can take national service into the new century, equipped to meet new challenges. President Bush has asked for $359M for FY 2004 to support his plan for Peace Corps expansion. Congress is getting ready to cut up to $45M from his request. Here's what you can do.